The rally stateside is supported by tax reform optimism, after Treasury Secretary Steven Mnuchin tells CNBC at Delivering Alpha he's more confident he can push through new policies. JPMorgan CEO Jamie Dimon takes aim at President Trump's policies, saying the U.S. economy would be growing much faster if the administration got it's act together. Apple's iPhone X leaves investors underwhelmed, as the company reveals orders won't ship until November, while some of the new tech raises user concerns. The battle over bitcoin intensifies as Social Capital's CEO says he's massively long, but Jamie Dimon warns it's a fraud that will blow up. 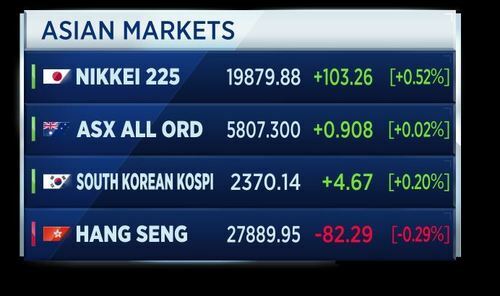 Asian markets were lifted to a fresh 10-year peak during the overnight session. This comes after a strong session in the U.S. where fears about Hurricane Irma and North Korea are fading. 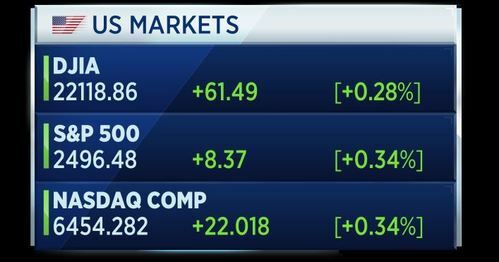 The Dow rose and the S&P closed at a record high. 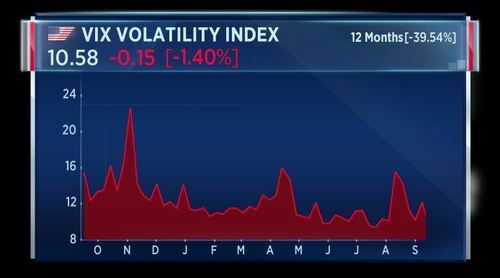 Wall Street's volatility index, the VIX, is still recovering from a 20-year low hit over the summer. 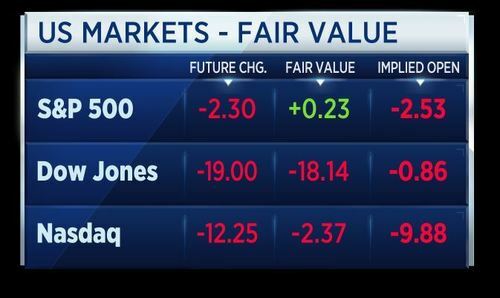 Calmer equity markets are part of why trading numbers at some of the world's biggest banks are down. Trading revenue at JPMorgan fell 14 percent year on year in the second quarter. Speaking at CNBC's Delivering Alpha conference in New York, CEO Jamie Dimon said volatility can be both good and bad. Dimon also spoke about growth in the US economy, saying it would be a lot better if Washington got itself into gear. The thousand pound smartphone is here. Apple has released the iPhone X, with the premium smartphone costing £999. At the launch event, Apple CEO Tim Cook also revealed the latest Apple 8 phones. The product launch also included the unveiling of the Apple Watch 3 and Apple TV 4K. CNBC’s Arjun Kharpal says this was the most important tech reveals for the company in a long time. There are a lot of questions whether this company can innovate any more. What’s next for Apple? What are the big things that are going to drive this company for the next five to ten years and I think Apple really delivered with the iPhone X. In this week's trader poll, we’re asking for your thoughts on Apple. Now that Apple's new phones are unveiled, are you hanging up on the stock? Yes, No, or maybe you're waiting for reaction to the launch? Click on the link below to to cast your vote. You can also have your say on Twitter using #traderpoll. 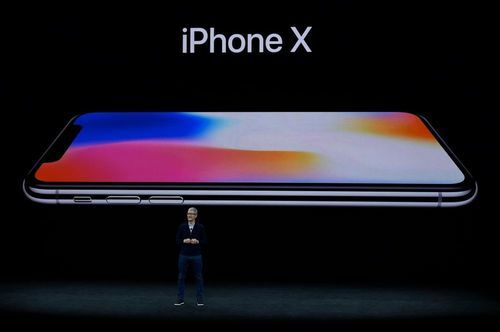 Apple has launched its highly anticipated iPhone X. Are you hanging up on the stock? 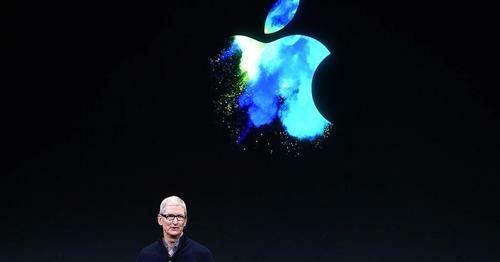 Apple launched not one or two, but three new iPhones at its highly anticipated launch event on Tuesday. The U.K. government has referred the 21st Century Fox bid for Sky to the competition regulator. It creates another delay in the near £12 billion take-over process with both companies saying they are disappointed in how long the process has taken. Culture Secretary Karen Bradley said she felt she had no choice at this point to refer the deal, over concerns about media standards and ownership. The Chinese firm LinkGlobal Logistics is poised to submit a bid to acquire the insolvent airline Air Berlin, according to a report in the German newspaper 'Bild'. LinkGlobal is the latest in a list of companies to express an interest in buying the airline's assets. However, Air Berlin's attempts to sell itself suffered a setback yesterday when a number of its pilots failed to turn up to work, resulting in mass flight cancellations. DowDuPont has altered some of its post-merger plans in an attempt to avoid a fight with some high profile investors. The group will be creating 3 different units but has reconsidered what is included in each, due to pressure from Nelson Peltz's Trian Partners and Daniel Loeb's Third Point. Shares in DowDuPont rose sharply on the news. Toshiba has signed a memorandum of understanding with Bain Capital regarding the sale of its memory chip business. A group led by Bain has offered to pay more than $18 billion for the semiconductor unit. Toshiba's board plans to continue negotiating with Bain and it aims to sign a contract by late September. However, Toshiba says the MOU doesn't eliminate the possibility of negotiations with another consortium. German final August CPI comes in at 0.1 percent on the month and 1.8 percent on the year, matching expectations. Wholesale prices grew 0.3 percent on the month and 3.2 percent year on year, that's up from -0.1 percent month on month and 2.2 percent year on year in July. The rally stateside is supported by tax reform optimism, after Treasury Secretary Steven Mnuchin tells CNBC at Delivering Alpha he's confident he can push through cuts and could even backdate them to January 1st. South Korean officials say that traces of radioactive gas are confirmed to be from a North Korean nuclear test earlier month. South Korea's Nuclear Safety Commission could not confirm that the test was for a hydrogen bomb, as Pyongyang claims. This comes as the U.N. Security Council steps up sanctions against North Korea after the regime conducted a sixth nuclear test earlier this month. 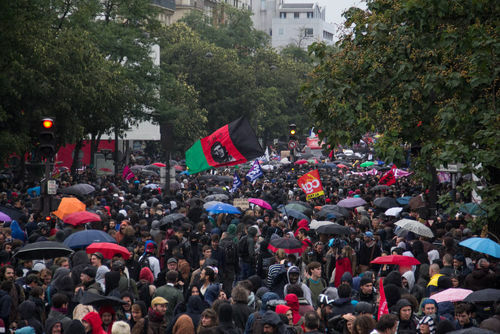 Hundreds of thousands of protestors have taken to the streets of France to campaign against President Macron's plans to overhaul the country's labour code. The demonstrations were largely non-violent with the exception of a few minor incidents. France's unions say they will continue to stage protests throughout the autumn as the country's centrist government works to pass its labour market reform bill. But two of the biggest groups have distanced themselves from the action. 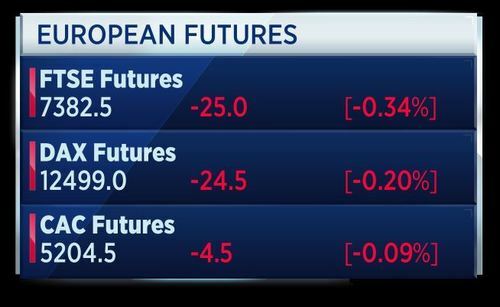 European markets are expected to fall at the open this morning. 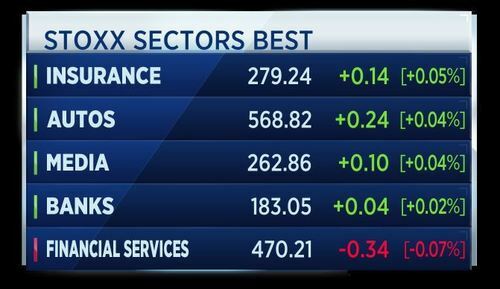 That's despite gains during the U.S. session and a strong Asian session. Western Digital was another company in talks to acquire Toshiba's semi-conductor business. 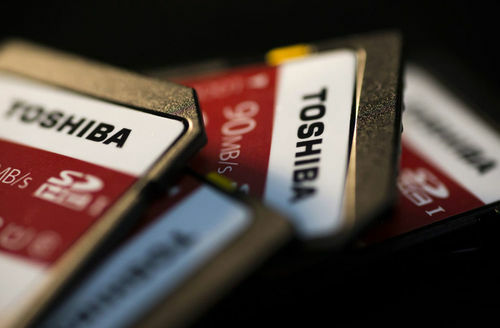 In reaction to news that Toshiba has signed a memorandum of understanding with a consortium led by Bain Capital, Western Digital says it is disappointed but its goal remains a mutually beneficial outcome. Western Digital says it is surprising that Toshiba would continue to pursue transactions with the consortium without Sandisk's consent. Western Digital says it remains confident in its ability to protect its joint venture interests and consent rights. That is the clear message from Jamie Dimon. 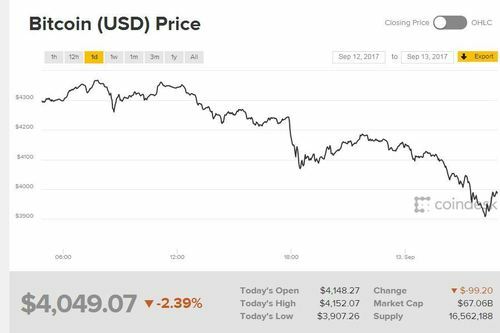 His comments have helped send the cryptocurrency below $4,000, after coming under pressure by China's crackdown. Dimon told CNBC's Andrew Ross Sorkin at the Delivering Alpha conference that he thinks bitcoin will eventually blow up. Dimon's opinion on bitcoin pitted him against other financial heavyweights at the conference. The CEO of Social Capital, who has been long bitcoin for a long time, said there is only so much governments can do to control the rise of the cryptocurrency. Bitcoin is currently trading around $4,049. 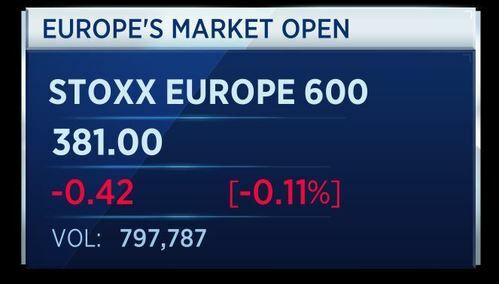 The pan-European Stoxx 600 falls at the start of trade. 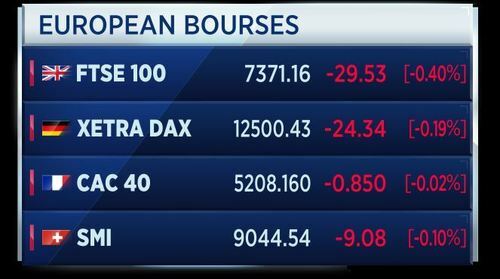 Losses are spread across the individual European bourses. The FTSE 100 is the biggest loser so far, partly due to sterling hitting a 1 year high against the dollar. 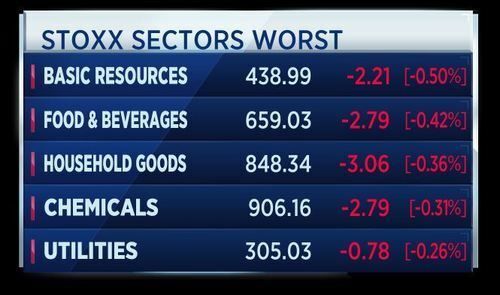 Only a handful of sectors are recording gains at the start of Wednesday trade, the rest are falling. EU President Jean-Clause Juncker is delivering his state of the union address, saying Europe can deliver for its citizens. He is making the address in English. He says unemployment is at a nine year low and 235 million are at work, more than ever before. He says Europe is on the path of recovery. Juncker says the wind is back in Europe's sails and there is a window of opportunity for the union right now. Juncker says now is the time to build a more united, stronger and more democratic Europe for 2025. The euro is rising against the dollar following his comments. Jean-Clause Juncker says the EU should open trade talks with Australia and New Zealand and conclude new trade deals by 2019. Juncker also said the EU is planning an industrial strategy to ensure industries stay competitive, as well as investment screenings for foreign investments into strategic EU assets and companies. Juncker praises Italy's perseverance and generosity in handling the migrant crisis and says the EU will work to improve conditions for migrants in Libya. 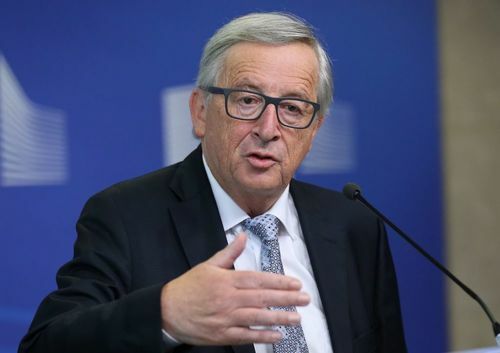 Juncker says the EU will propose a new migrant deportation policy by the end of the month; he says the union must step up actions to send back migrants who do not merit refugee protection. These are the top headlines after the market open. A chip on its shoulder! Shares in Apple's European suppliers slump after the company reveals its new iPhone Ten will ship later than expected. JPMorgan CEO Jamie Dimon takes aim at President Trump's policies, saying the U.S. economy would be growing much faster if the administration got its act together. Embrace new opportunities. That's the message from European Commission President Jean Claude Juncker, as he strikes a bullish tone in his state of the union address. Sweden's Q2 GDP grew 1.3 percent quarter on quarter and 3.1 percent year on year. 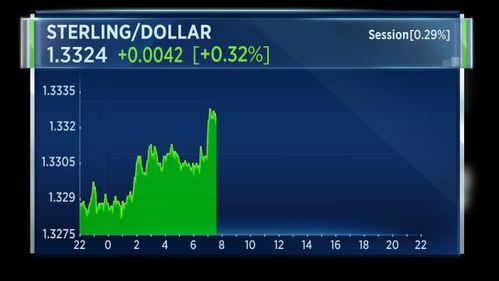 Sterling is up a third of a percent against the dollar this morning, rising to a 1-year high against the U.S. currency. 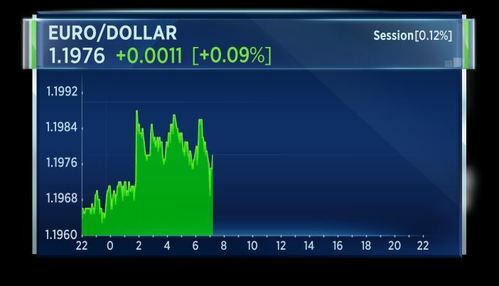 The U.K. currency is carrying on the move higher seen yesterday following strong inflation data, which is driving expectations that the bank of England may move to raise interest rates, according to Reuters. EasyJet is to launch a global airlines connections service. The scheme, "Worldwide by EasyJet", allows customers to but other airlines' flights on its website. Norwegian Air is the first airline to partner with EasyJet for the scheme. Norwegian Air's long-distance flights will become available to EasyJet customers, which is expected to increase ticket sales. The COO of EasyJet says they hope to get one or two more airports involved in the connection service before the end of the year. The COO says there are no cost ramifications from the service. Jean-Claude Juncker is continuing to read his state of the union speech. He says the EU will set up an agency to enforce employment rules across the bloc. He says products sold in the EU should be equal quality and the east should not have lower-quality foodstuffs. He says the EU has a very good chance of a free trade agreement with Mexico and with Mercosur. Juncker says Bulgaria and Romania must be brought into the Shenghen zone and later Croatia. He says the EU should also help countries to join the euro zone and must offer credible membership prospects to the West Balkan states. The president of the EU Commission also proposed a euro zone finance minister who would serve as vice president of the EU Commission and president of the Eurogroup. He also suggests an intelligence unit to coordinate on security and terrorism prevention, and the EU should be able to remove national vetos on foreign policy. Commenting on the latest oil market report, Neil Atkinson, head of the oil industry and markets division at the IEA, says the impact of the hurricane season in the U.S. will not be a huge hit. There is a very sharp, fast rebound, because for one thing oil is used in some of the recovery efforts to get back on their feet after the hurricane. So it’s a short dip and then a very sharp rebound. He says the recent hurricanes will not have a last impact on oil demand or refinery activity, although there is a hit over one month or one and a half months. EU Commission President Jean-Claude Juncker says the British will soon regret their decision to leave the EU, just as the EU regrets their leaving. He said this towards the end of his state of the union address. He says Brexit is not the future of Europe and Europe will go on. Juncker proposed a summit to be held on March 30, 2019 (the day after the Brexit process is scheduled to finish) in the Romanian city of Sibiu to map out the future of the EU. Here is a round up of corporate news affecting the markets. Bayer has cut its stake in plastics business Covestro from 41 percent to 32 percent, gaining 1.2 billion euros in the sale. The German drugmaker plans to fully sever ties with Covestro in the medium-term. Offshore drilling company Seadrill is filing for Chapter 11 bankruptcy after striking a deal with almost all of its senior lenders. Under the plan, they will inject around 1 billion dollars of fresh capital into the company. Seadrill expects to continue day-to-day operations as normal. Richemont shares are under pressure despite beating expectations with 12 percent sales growth for the 5 months through August. The luxury goods group said a strong performance in its jewellery business had helped drive the results, which come after a period of declining sales. The makers of Cartier did not nominate a successor to its watchmaking business or provide expectations for the coming months. The Turkish presidential advisor Cemil Ertem tells Reuters that he sees an improvement in relations with Germany after the upcoming election. He also expects relations with the EU to imrpove rapidly in 2018. The advisor expects a good 2018 tourism season boosted by improved EU relations and says the economy will grow 5.5 to 6 percent this year and 5 to 7 percent next year. The U.K. government has referred the 21st Century Fox bid for Sky to the competition regulator. It creates another delay in the near £12 billion take-over process with both companies saying they are disappointed in how long the process has taken. Culture Secretary Karen Bradley said she felt she had no choice at this point to refer the deal, over concerns about media standards and ownership. Britain's unemployment rate unexpectedly fell further to its lowest since 1975 during the three months to July, but wage growth proved even more subdued than expected, official figures showed on Wednesday. The data are likely to deepen division at the Bank of England over whether the time for an interest rate rise is nearing and will increase pressure on Prime Minister Theresa May's government to further loosen the cap on public-sector pay. The number of people in work rose to a record high of 32.136 million as 181,000 people gained jobs, the strongest increase since late 2015 and belying other signs of sluggish economic growth this year after last year's Brexit vote. The rapid job creation took the unemployment rate down to 4.3 percent from 4.4 percent. August CPI data presented yesterday showed that headline inflation surprisingly accelerated to a new five-year high of 2.9% year-on-year, up from 2.6%. Also the core inflation gauge (excluding energy and food items) rose to 2.7%. The main contributor to this rise was the price of clothing, which is a clear result of imported inflation from the weaker pound sterling. The renewed rise of inflation is not completely unsurprising, as the pound had trended lower in past weeks due to the visible frictions between the UK and the EU in the Brexit negotiation rounds. So far, the parties are still far from agreeing on an exit deal, which is a precondition for trade negotiations and the most crucial item in the Brexit roadmap for economic growth. As a result of the rise in inflation, markets are becoming more upbeat again about a potential rate hike by the Bank of England. Markets’ rate expectations have shifted, now hoping for a hike in February 2018, which has in turn lifted the pound back to EUR/GBP 0.90 levels. However, we do not believe that the Bank of England will dare to hike rates as long as the outcome of the Brexit remains highly uncertain. As long as rate fantasies limit the pound’s weakness, the BoE can still afford to sit through the inflation overshoot. French President Macron to present euro zone reform proposals on September 26. That's according to Reuters citing a diplomatic source. The clean energy sector will be a massive engine for job growth in the United States given the increasing focus on the adoption of green technology, according to Milken Institute chairman Mike Milken. Milken was speaking to CNBC's "Street Signs" on Wednesday at the sidelines of his institute's Asia Summit 2017 in Singapore, touching on topics ranging from the impact of technology on jobs to future growth industries. The move into clean energy is going to create a lot of jobs in that area ... right now the number one growth (profession) in the U.S. is windmill technician, the philanthropist and former financier said. Milken said the finance industry is not coping as well as the clean energy sector. Commissions for equity sales, for instance, have declined and forced many people to go into other jobs. The use of mathematics, big data, statistics will be applied in all industries including finance," he said. "We need to make sure people are trained in the (new areas) and we also have to focus on access to capital. 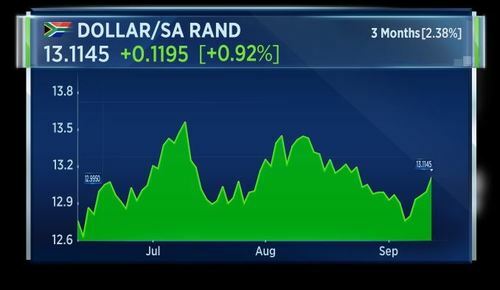 South Africa's rand weakens more than one percent against the dollar on profit taking, Moody's warning. Moody's on Wednesday warned that the gradual erosion of South Africa's institutional framework and recent pressure on the central bank to change its price and inflation targeting mandate were key risks to the country's credit rating. Zuzana Brixiova, a senior analyst for the ratings agency, also told a conference in Johannesburg that space for the Treasury to implement counter-cyclical fiscal policy to keep deficits in check had been eroded. Japan's Mitsubishi UFJ Financial Group Inc said it has picked Amsterdam as its European Union investment banking base, as financial institutions prepare for Britain's exit from the EU. Japan's largest lender is following the footsteps of other banks and financial services firms that are setting up regulated subsidiaries in an EU country so that they can do business across the bloc if Britain loses access to the European single market. MUFG Securities EMEA plc, the European investment banking unit of MUFG, currently has its head office in London with staff of about 600 people. The new subsidiary in Amsterdam will ensure that the Group can continue to provide these (securities) services to its EU clients, even if the cross-border passport is lost as a result of Brexit, MUFG, which has $2.8 trillion in assets, said in a statement on Wednesday. The S&P 500 rose 0.3 percent to close at 2,496.48, achieving intraday and closing records. The Dow Jones industrial average finished at 22,118.86, managing to deliver a record close. The Nasdaq composite closed 0.3 percent higher at 6,454.28, a record closing high. VW Brand CEO says long-term profit goals not at risk over electric car push brand. The CEO says European battery-cell pact to boost competition for Korean suppliers. The CEO also wants European industry to push back for EV battery cells. That's according to Reuters. 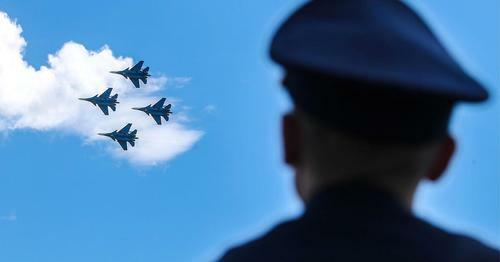 Russia's huge military exercise along its western border this week has increased nervousness among neighboring countries as well as straining relations with NATO. The "Zapad 2017" military exercise, running from the 14th until the 20th September, is held every four years and will on this occasion include activities on the borders of Poland, Lithuania, and Belarus. The main purpose of Zapad, which literally means west, is to simulate defense and counter-attack in case of war with NATO member countries. CNBCMoscow stands accused of hiding the true intentions of its week-long war games. Societe Generale says time to take profits from Italian stocks, says German stocks a tactical buy. 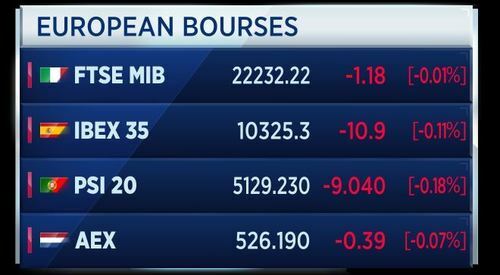 The bank says keeps preference for French equities, remain neutral on FTSE100. U.S. mortgage applications leap nearly 10% on lowest rates in almost a year. CNBCHomebuyers are clamoring to capitalize on the lowest interest rates in almost a year, driving mortgage application volume 9.9 percent higher. UK PM May says need for greater flexibility on public sector pay, government will be working on it lead up to budget. That's according to Reuters.